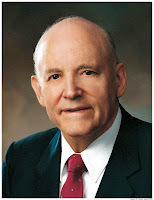 "For Latter-day Saints this is a time of great hope and excitement—one of the greatest eras in the Restoration and therefore one of the greatest eras in any dispensation, inasmuch as ours is the greatest of all dispensations. We need to have faith and hope, two of the great fundamental virtues of any discipleship of Christ. We must continue to exercise confidence in God, inasmuch as that is the first principle in our code of belief. We must believe that God has all power, that he loves us, and that his work will not be stopped or frustrated in our individual lives or in the world generally. He will bless us as a people because he always has blessed us as a people. He will bless us as individuals because he always has blessed us as individuals." Prophets are optimistic. 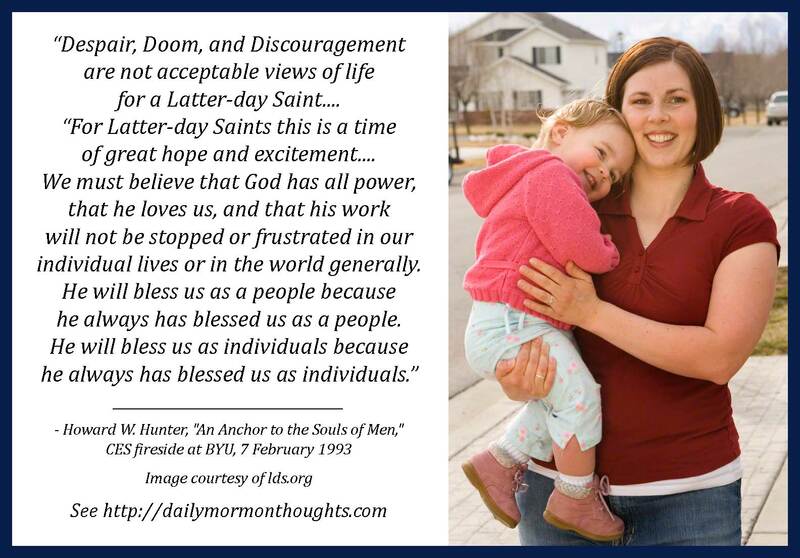 They recognize and acknowledge challenges and difficulties, but also have a sense of the future that doesn't allow for the "three D's" that President Hunter warns of: "Despair, Doom, and Discouragement." Instead, they dwell on "the great fundamental virtues of any discipleship of Christ" which are faith and hope. These remarks were shared in 1993, more than 23 years ago. Some would argue that our time and our challenges are quite a bit different than what President Hunter dealt with. But the principles of faith and hope in the midst of obstacles are not outdated. This is still "the greatest of all dispensations" and the greatest era of responsibility and potential. God still promises to bless His people, individually and collectively. 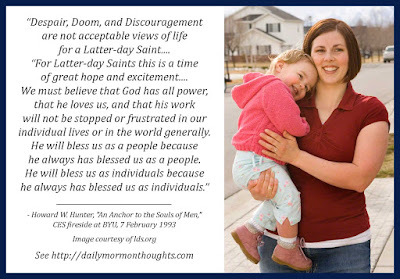 Our great task is to allow faith and hope to replace doom, despair, and discouragement. Labels: challenges, despair, discouragement, faith, hope, Hunter Howard W.